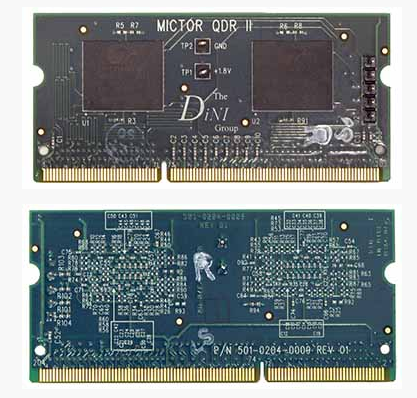 The DNSODM204_QDR-II+ is a SODIMM module that can be installed in a 204-pin DDR3 SODIMM socket. This module contains two QDR-II+ SSRAM's chips in a 4M x 32 configuration for a total of 16 megabytes. Stuffed with 2 Cypress CY7C1543KV18-450BZI, the DNSODM204_QDR-II+ has separate 32-bit input and output busses. Each bus is double data rate (DDR), allowing for very high performance reads and writes. With Xilinx Virtex-6 FPGAs, this SODIMM will operate at 400MHz (800Mbits/s per pin). The DNSODM204_QDR is compatible with the 204-pin SODIMM DDR3 sockets on the DN2076k10, DNV6_F2PCIe, DNV6F6PCIe, and DN-DualV6-PCIe-4. Reference designs are provided.